Ultra-shallow, surface mounted fixtures are becoming a hot trend in the industry, driven primarily by the plunging costs of mid-power LEDs. 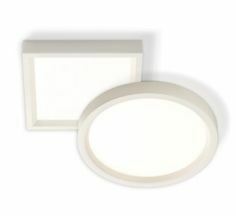 Lightolier recently released an interesting exploration in this area with their “Slim Surface Downlight” series. 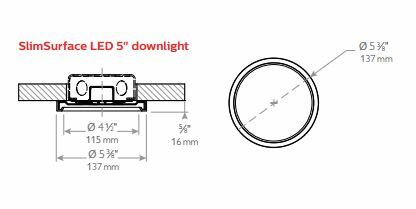 Using an edge-lit light-guide, the Slim Surface creates a soft plane of light in a housing only 5/8″ thick (16mm). The driver housing is deeper, but Lightolier sized the driver enclosure to sit within standard North American-style recessed junction boxes. I like the appearance of the fixture, mostly because I always spec’d my recessed downlights with white reflector cones to give a purposeful sense of brightness (I hate specular downlights — you can never really “hide” a downlight so why try?). There is a huge range of applications that benefit from transforming to surface mounted designs, reclaiming plenum space. It also simply cuts down on the physical and ecological costs of manufacturing and shipping bulky fixtures.